We advocate for district policy that supports health and wellness in Chicago Public Schools, and work to build the capacity of the district and individual schools to successfully implement this policy. A healthy school environment is an important foundation for learning and academic success. 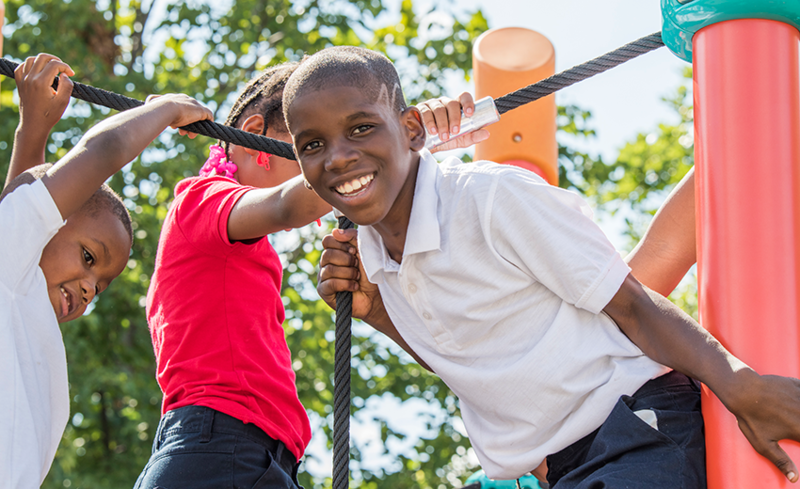 Policy supporting healthy eating and physical activity is especially critical in Chicago, where more than 85 percent of students are at increased risk for chronic health conditions and obesity. In Chicago Public Schools (CPS), 48.6 percent of sixth-graders are overweight or obese, according to a report from the Chicago Department of Public Health. In low-income neighborhoods with a majority of residents of color, rates of overweight and obesity can be even higher. Rates of overweight and obesity ranged from 26 percent in Lincoln Park (a predominantly Caucasian community) to 45 percent in Oakland (a predominantly African-American community) to 52.3 percent in South Lawndale/Little Village (a predominantly Latino community). Addressing these inequities and promoting health and wellness have been identified as top priorities at the city level, as evidenced by the Chicago Department of Public Health’s broad spectrum public health agenda, Healthy Chicago 2.0. This plan includes a commitment to reducing the prevalence of and inequities related to obesity and related illnesses, recognizing that this is central to achieving equity in education and health. In this context, strong and effective policy is key to ensuring that all CPS students are attending schools that promote health and allow them to be the best learners they can be. It is also key to ensuring our city creates a healthy and equitable future for the next generations. One of the most effective tools in shaping healthy school environments is a strong wellness policy, the name given to policies addressing school food, physical activity and physical education in schools. The wellness policy, a federal requirement established in 2004, guides the district’s efforts to promote healthy eating and physical activity, support student learning and help address our nation’s obesity epidemic. CPS has adopted three policies that promote healthy eating and physical activity. They include: the Local School Wellness Policy, the Healthy Snack and Beverage Policy and the Physical Education (PE) Policy. Combined, these policies address nutritional standards for food served in cafeterias and vending machines as well as requirements for nutrition education and physical education. 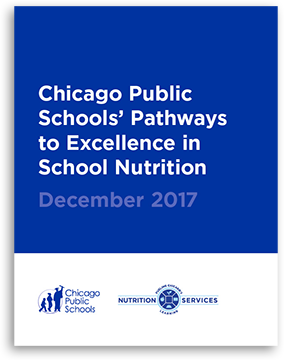 In June 2017, the Chicago Board of Education adopted a new Local School Wellness Policy, a new Healthy Snack and Beverage Policy and a Breakfast in the Classroom Policy. The newly adopted policy includes a number of provisions that advance the health and wellness of students. 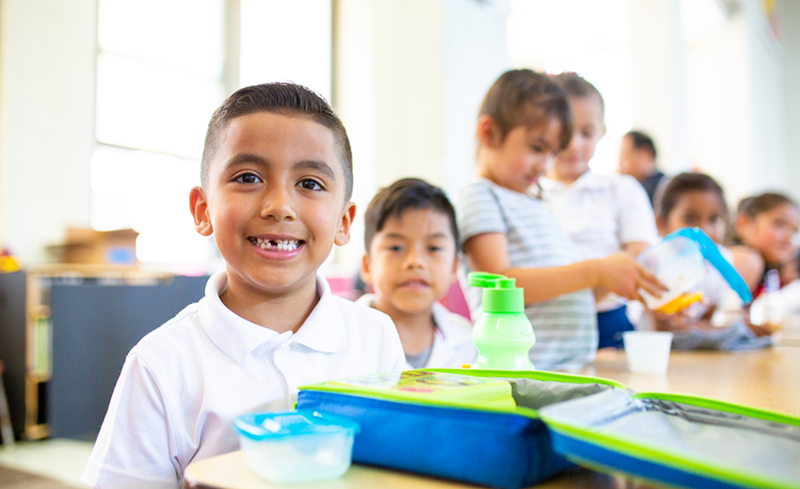 The policy strengthens school food policy, increases access to nutritious foods, restricts junk food marketing, and promotes healthy classrooms and schools. You can read more about our analysis of the new policy on our blog. A number of CPS efforts to promote student nutrition and physical activity set the stage for the current wellness policy. For example, between 2010 and 2013, CPS implemented, in partnership with HSC, Go for the Gold in Food and Fitness, a local response to First Lady Michelle Obama’s call for an end to childhood obesity. Go for the Gold encouraged schools to meet the health-promoting requirements of the USDA’s HealthierUS School Challenge. The HealthierUS School Challenge is a voluntary, nationwide award program established by the USDA to recognize schools that meet best practices and standards around school food, nutrition education and physical activity and education. More than 200 CPS schools received recognition from the USDA for meeting the requirements of this program. In 2007, CPS piloted Breakfast in the Classroom, a program that provides a free in-classroom breakfast for all elementary students, regardless of their families’ income. The program was expanded to all elementary schools in 2011. CPS also received two federal grants: the Communities Putting Prevention to Work (CPPW) grant from the Centers for Disease Control and Prevention (CDC) and the Carol B. White Physical Education Program grant from the U.S. Department of Education. These federal grants helped CPS develop tools and resources and implement comprehensive school-based policies and practices to create healthier school environments. Download and read the full policies on our Resources tab. In the largest nationwide evaluation of school district wellness policies across the country, the CPS wellness policy was found to be both stronger and more comprehensive than the nationally represented average sample of more than 700 school districts. This reflects CPS adherence to evidence-based best practices in the written policy language. Action for Healthy Kids completed a wellness policy analysis for the Urban School Wellness Coalition members using the Wellness School Assessment Tool (WellSAT). When compared to peer school districts, the CPS wellness policy is also stronger and more comprehensive—ranking second in a group of 10 large, urban school districts. This review also highlighted a number of areas in which the CPS policy was weaker, including school meal standards, evaluation and communication. Our recommendations highlight how CPS can strengthen these specific areas of its wellness policy. What Is the Impact of the Wellness Policy? The most important measure of the success of the CPS wellness policy is its effect on student health and learning. 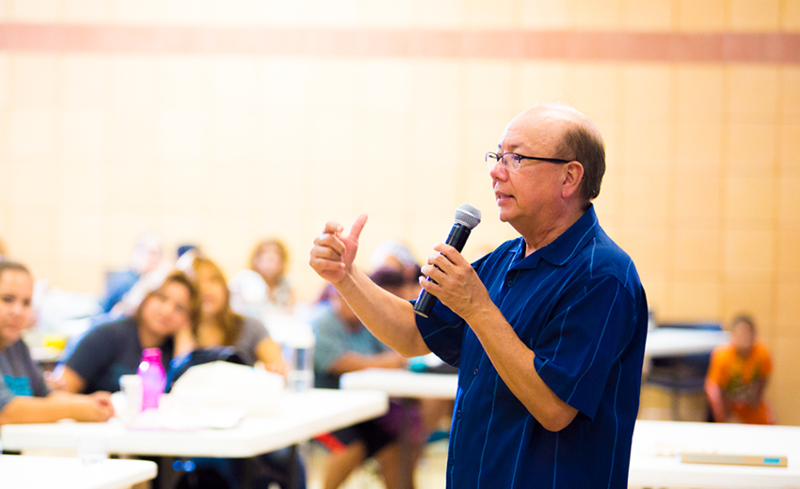 The impact of the wellness policy was assessed through conversations with teachers, parents, principals, network chiefs, school wellness champions, partners and other stakeholders. Stakeholders said the wellness policy had a positive impact on the broad areas of student health, behavior and academics. School wellness champions mentioned “happier” and “better focused” students. Stakeholders also highlighted how awareness of health and wellness is beginning to resonate throughout the CPS community. Principals believe that the wellness policy, coupled with stakeholder awareness, has resulted in a shift in school culture that now connects student health with student readiness to learn. CPS has made great progress in promoting health and helping schools implement the components of its wellness policies. To build on this important work and ensure that all schools have the tools, resources and support to create healthy environments and allow all students to thrive, we developed recommendations to further strengthen the district’s wellness policy. Our recommendations address ways to remove structural barriers, effectively integrate health and wellness policy goals into accountability measures and to support student health and wellness. Support all CPS schools in meeting wellness policy requirements: The CPS Office of Health and Wellness and the district overall should have the direction, resources and support to help all schools, whether they be neighborhood, low-performing, charter or AUSL-managed, to meet the district’s wellness policy requirements and create a culture of health that allows students to thrive. Download and read the full recommendations. Sign on to support our recommendations on the What You Can Do tab. Our recommendations address ways to remove structural barriers, effectively integrate health and wellness policy goals into accountability measures and to support student health and wellness. Download and read the full recommendations. I firmly believe that a strong wellness policy and its implementation in CPS is critical to the future of our city’s children. I am signing on to this form as an individual and expressing my support for healthy Chicago schools. On behalf of my organization, I would like to add our name in support of these recommendations. 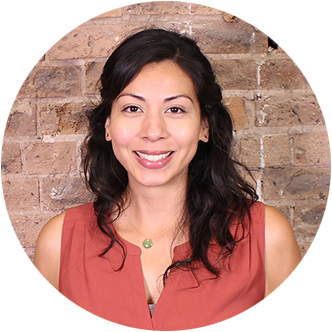 How has healthier school food, more physical activity and physical education improved your children’s health, your school environment or your community? CPS requires that schools offer daily physical education or 150 minutes per week of PE. This can be especially challenging for some schools. However, since more than 85 percent of students in Chicago are at increased risk for chronic health conditions and obesity, PE is especially critical. We must find creative ways to implement the policy. Schools play an important role in supporting student health and wellness. Studies document what teachers, parents and education leaders know: healthy students are more likely to attend school and are better able to focus in class, which ultimately leads to higher test scores and overall higher classroom achievement. 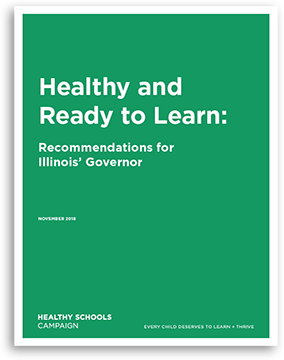 HSC is pleased to present Healthy and Ready to Learn: Recommendations for Illinois’ Governor. The following recommendations are ways in which state leadership can support schools and their communities in creating conditions for improved school wellness and student health over the next four years. This toolkit lays out a simple framework to assist Chicago Public Schools schools in incorporating health and wellness into their school improvement plans—and ensure all students have the opportunity to be the best learners they can be. Celebrations and rewards are a big part of school culture. Help students make nutritious food choices all day long! Beyond regular meals, snacks are sometimes offered during in-class celebrations or as rewards from a teacher. When schools reinforce healthy habits in the classroom, students learn consistent lessons that can last a lifetime.